OCALA, FLORIDA – The Ocala Stampede are pleased to announce that Admiral, the Original British Football brand to American and England’s top teams, will be the official uniform supplier to the Stampede beginning in the 2012 Season. The Stampede play in the USL PDL league. The PDL is the top level of men’s amateur soccer in the US with 70 teams in nine regional divisions it is the 4th tier of US soccer. Admiral is the same brand that provided team wear in the 1970’s and 1980’s for the England football teams, Manchester United, Tottenham Hotspur, West Ham, Southampton and Leeds in the English Premier League. Admiral was also the market leader in the United States on the shirts of the Los Angeles Aztecs, Tampa Bay Rowdies and Vancouver Whitecaps. Players who have worn Admiral include soccer legends Pele, Beckenbauer and Cruyff while they played for the New York Cosmos. Today the brand is also worn by ten other PDL clubs including 2011 PDL Champions Kitsap Pumas and the 2011 NASL Champions Minnesota Stars. 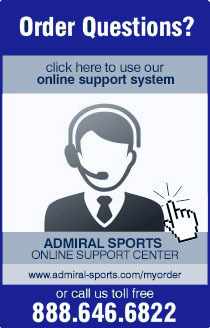 “We’re delighted to be launching Admiral with in our first PDL team in Florida." says Paul Hamburger, President and CEO of Admiral Soccer. “Admiral is totally focused on supporting the needs of community soccer teams throughout the United States. We’re really looking forward to working with the Stampede’s players, fans and the Ocala soccer community. The goal is to outfit all of the NASL, USL and youth soccer in the original soccer jersey,” says Hamburger. In addition to developing players within the PDL the team are building; U18, U16 and U14 teams. PDL Players will assist with summer camps that draw young soccer players to the club. They’ll also take the soccer ministry to youth in low-income locations. “What made the decision simple for us was the effort Admiral made to work with us, understand our needs and what’s important to us and Admiral just gets it,” said Reed. The Stampede will unveil their new Admiral kits to fans and media in the 1st week of May before their first game away against VSI Tampa Flames on May 6th. For more information on the Ocala Stampede including sponsorships, internships, tickets or to volunteer, visit www.ocalastampede.com or call (352) 804-0132.